If you’re unfamiliar with the Nima, it’s a portable testing device that detects gluten in food. 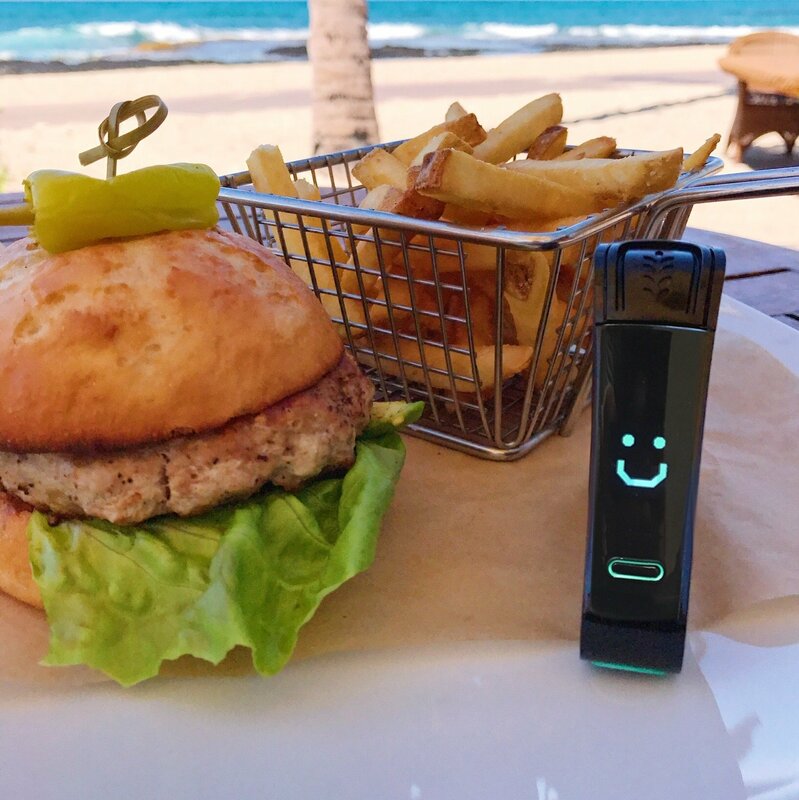 It’s a bit like a small chemistry set: you put a pea-sized sample of food you want to test into a capsule, place the capsule in the Nima sensor and about three minutes later the device signals if it does or does not detect gluten. 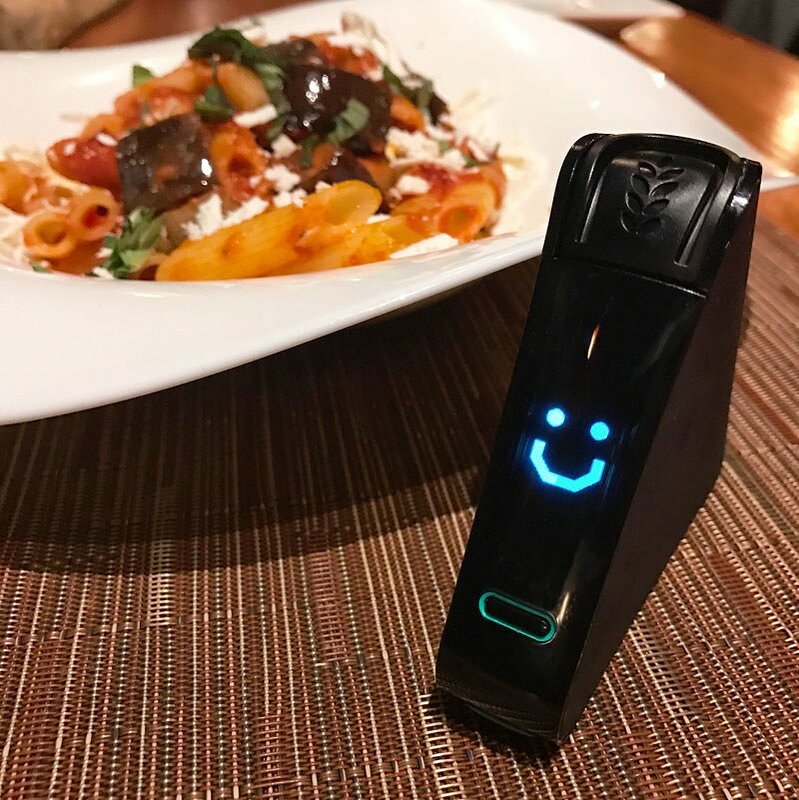 A cute little smiley face on the screen means “no gluten,” and that’s a great thing to see when Nima-testing your food! We were early adopters of the Nima. Over a year ago I had an opportunity to connect with some of the wonderful folks at Nima Labs when CEO and co-founder Shireen Yates skyped into one of our Raising Our Celiac Kids meetings. She tested food we had sent her and answered questions, so I had some familiarity with the Nima device. I decided to pre-order one and got it last fall. This February break, however, was the first time we traveled with the Nima, and the family was really excited! To give a little background, my son was diagnosed with celiac disease and has been eating a strict gluten-free diet for over six years. We’ve gotten comfortable asking questions, reading menus and ingredient lists with care, and using our best judgment in determining whether food is safe for him. But as any celiac family knows, dining out on a restricted diet requires lots of planning, and eating every meal out for ten days can be potentially stressful. Add to that the fact that we were traveling with extended family. Ten people visited two states and traveled through five airports. 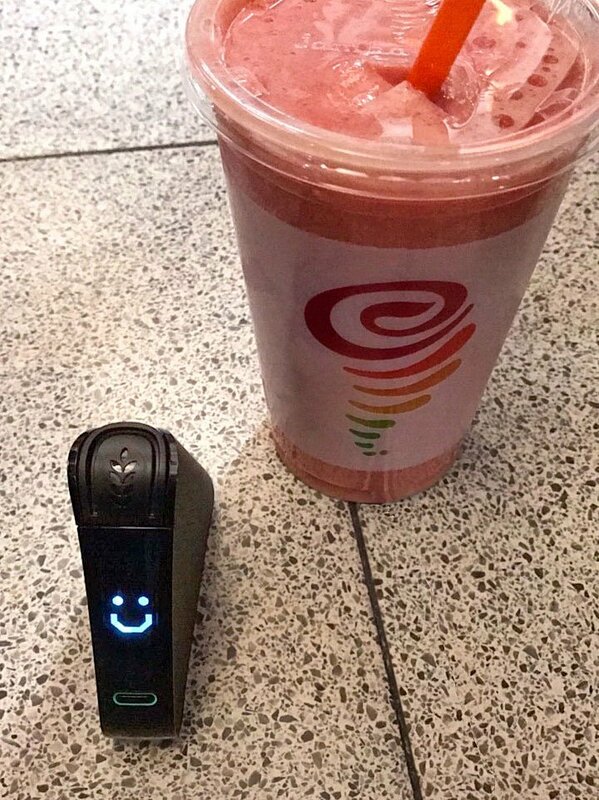 We were happy to have the Nima Sensor along with us! Another tool in the toolbox to help us determine if food is gluten-free and safe for our son. Approaching the vacation we wondered when and how often we might use the Nima. What we would do if we got a “gluten found” symbol on the display (a wheat symbol)? And the updated Nima now features responses for “low gluten” and “high gluten.” Would that change how we proceeded? So off we went, Nima in hand, first to Napa, California for a cousin’s wedding, and from there to family vacation time in Hawaii. We were particularly grateful to have the Nima with us when our usual questioning didn’t help us feel 100% comfortable. As anyone with celiac knows, in food prep there is always a risk of cross-contamination. Typically, when dining out, if we aren’t comfortable with answers to our questions, or other aspects of a place we’re getting food from, we are more apt to skip eating altogether. We used the Nima a lot at airports and on the west coast when we weren’t in as much control over dining options. The first time we used the Nima was at JFK, before we even took off! My son was hungry, and the only place that seemed safe was Jamba Juice. The ingredients looked good, but the servers didn’t seem to know much about gluten-free. We followed our own best judgement and ordered a fruit smoothie. We decided to test it with the Nima: Smiley face! Off to a good start! In the mornings the inn in Napa brings in a huge, appealing breakfast buffet. My first reaction was: yikes! There’s no way my son will find anything here. After my initial panic, we learned there was an omelette station, roast potatoes and fresh fruit — all of which my son loves. We asked the servers about the omelettes and the potatoes. They assured us everything was gluten-free—but we were still skeptical. Nima to the rescue: we tested the omelette and the potatoes and both got a smiley face! So far, so good. We were following our own judgment but the Nima was reassuring. The downside of using Nima with every meal while on vacation is that it takes time. It’s only a three-minute process, more or less, but when everyone is hungry and eating while you wait, that can feel like an eternity. Other diners may be halfway through their meal before you even start yours. Because of this, there were times when although we had the Nima, we opted not to use it. In Hawaii we were blown away by how aware all the hotels and restaurants are about celiac disease and cross-contamination. We always called ahead and made a reservation with a note about being celiac and our need to eat strictly gluten-free. But from the moment we walked into a restaurant, servers and managers reassured us with a show of knowledge about gluten and cross contamination as it related to their menus: they really “got it.” There were many times, especially with ten of us dining out, that we opted not to use the Nima and instead to trust our judgment, just as we always do. It felt a little odd not to use this valuable extra tool when we had it, but sometimes it was freeing and relaxing to just ask questions and enjoy the meal. Net-net, we loved traveling with the Nima. Being away from home for ten days and unable to control ingredients or food preparation can be scary when you are on a restricted diet. Having this extra tool in our toolbox to help with our decisions was comforting and empowering. Nima is not without its limitations. For example, cross-contamination in food is not evenly distributed so a small sample may not be representative of the presence of gluten in the entire dish. It’s a tool and in using it you still have to rely on your own best judgment, but we were so happy to have Nima with us while we traveled! And the best part of an already great vacation? My son didn’t get gluten-ed! If you are interested in purchasing a Nima, you can use the Promo Code HGFF for $15 off a Nima Starter Kit. Disclaimer: I want my readers to know exactly where I stand with products and ingredients I may recommend or feature in my blog or social platforms. While Nima sponsored this post, the views and opinions expressed here are entirely my own. Because I have found the Nima Sensor to be quite useful, I agreed to act as an affiliate for marketing their device. That means I receive a small payment if you purchase a Nima using my promo code. We are from New Zealand and the Nima sadly isn’t available here yet. Thank you for this comment as we are heading on holiday to Hawaii is Sep! Happy to help! What island are you headed too? I have a post about dining out on the Big Island. We also went to Oahu and Maui a few years back… if you’re headed there, that could be just the inspiration I need to write about those restaurants!